A couple of months ago I had the pleasure of seeing Joe Schloss, adjunct professor at NYU, speak about b-boy culture along with Ken Swift. Schloss spoke about b-boying in a way that I had never heard anyone speak before, combining the rigor of academic inquiry with insider knowledge as a practitioner of the craft. 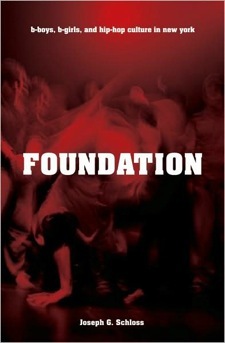 I finally got around to reading Schloss's book on b-boy culture called Foundation (Oxford Press, 2009). I have to say that it's got to be the best book on b-boying ever written, if only for the fact that it has been so poorly studied and researched. Among the four planks of hip-hop culture — MCing, graffiti, DJing and b-boying — it's the one that has been the least examined and understood by academia and the general public. Joe Schloss makes a firm contribution to the field with Foundation, writing an in-depth examination of the New York b-boying scene in the mid-2000s, interviewing countless dancers, from the most legendary founders of the dance like Ken Swift and Fabel, to up-and-coming b-girls and b-boys. More than just a transcription of interviews, Schloss goes deeper into what makes b-boying unique as a cultural phenomenon. Schloss discusses the "canon" of b-boy music, which is rooted not in hip-hop but in 70s funk and rock and roll. Then he describes how b-boy knowledge is passed from dancer-to-dancer, and how the originator of a particular move is given importance and preserved. At the same time, the quintessential essence of b-boying is maintained and enforced across cultures and styles through competition the cypher. Personally, I have found Foundation to be very helpful in understanding and putting into words aspects of b-boying that I have suspected but never seen explicated. The nature of how b-boy knowledge is passed on is so different from anything I've experienced before, which has been a real roadblock to my own development as a b-boy. While not suggesting any particular solution, it has helped me understand the culture as it stands. As an ethnography, Schloss's findings are limited to a very narrow, if important, slice of the b-boying phenomenon — New York City in the 2000s. I do have to question how much his findings are applicable to places like Seoul, Paris, or even Los Angeles. And as the legends and originators of the dance fade from memory and pass on, I do worry about how the community will continue to preserve the culture. Unlike other vernacular dances like tap, lindy hop and tango, there appear to be few institutions in place to ensure that the knowledge continues to be passed on to succeeding generations of dancers. For anyone wanting a deeper understanding of breaking, or just generally interested in vernacular dance and street culture, Foundation is a great read.